The West Center Drive Bruegger’s Bagels in Omaha, NE will bring back bagels and a convenient drive-thru on April 20, 2016. The location had been closed for repairs since the fall, when it was seriously damaged by a car accident. The bakery will offer several new menu items including New York-style coffeecake, Cheesecake Brownies and Greek Yogurt Blueberry Muffins. On Wednesday April 20, Bruegger’s Bagels will celebrate grand opening day with a free bagel with cream cheese or a small specialty espresso or coffee beverage for e-club members. 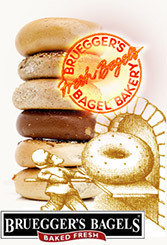 Guests can sign up for the Bruegger’s Bagels eClub here.